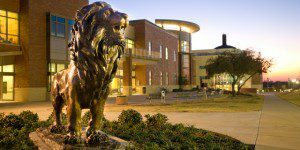 Texas A&M-Commerce was established in 1889 as East Texas Normal College in Cooper, Texas. The campus was moved to its current location in 1894 after a fire destroyed the campus in Cooper. The school was renamed East Texas State Normal College in 1917, and again in 1923 to East Texas State Teacher’s College. Graduate programs were added in 1935 and the college became the East Texas State College in 1957 in recognition of the school’s broader curriculum. After the inauguration of the first doctoral program in 1962, the school was rebranded East Texas State University. The University became part of the Texas A&M University System in 1996 and was given the name it holds today, Texas A&M University-Commerce. The College of Business is located on the Texas A&M – Commerce campus in the city of Commerce, Texas. Commerce is about a one-hour drive northeast of the Dallas metroplex. Additionally, Texas A&M Commerce students can pursue a MBA at the Universities Center at Dallas. Texas Commerce A&M also offers students the option to complete their MBA entirely online. The Gee Library, one of several Texas A&M – Commerce libraries, is open 24 hours. Students have access to computers, research materials, and group study rooms. The library also has a 24-hour laptop check-out service for students. Students at the Commerce College of Business also have access to the Global Entrepreneurism Lab. The GEL offers materials from local, governmental, volunteer and other organizations dedicated to entrepreneurship. These are available to both students and local small business owners. Commerce students can also utilize the office of Career Development on campus. Career Development offers students special events such as networking nights, job shadow programs, business etiquette dinners, career fairs, and job search workshops. The CD can also help students with resume and cover letter consultation, LinkedIn consultation, mock interviews, career assessment, and counseling and employment applications. Texas A&M Commerce campus features several areas for student recreation, the most impressive of which is the Jerry D. Morris Recreation center. The $12 million state of the art Campus Rec Center includes a 45-foot rock-climbing wall, a three-lane jogging track, four racquetball courts, two basketball courts, a large fitness and aerobics room, a snack area, and locker rooms. The outdoor area of the Rec Center includes a heated leisure pool, a two-tier hot tub with waterfall, two sand volleyball courts, two basketball courts, picnic tables, BBQ pits and a sunbathing area. Around 78 percent of students at Texas A&M Commerce identify as male, while 22 percent identify as female. Nearly 24 percent of the most recent class were born outside of the United States. Students entered the graduate school with around six years of prior average work experience. A total of 987 students enrolled in the most recent MBA program at the College of Business. The median GMAT score is 460 and the average GPA is 3.0. The acceptance rate for prospective students applying to the Commerce College of Business is 59.8 percent. Forty-four percent of students enrolled are women. Texas A&M – Commerce offers its MBA on campus and online.